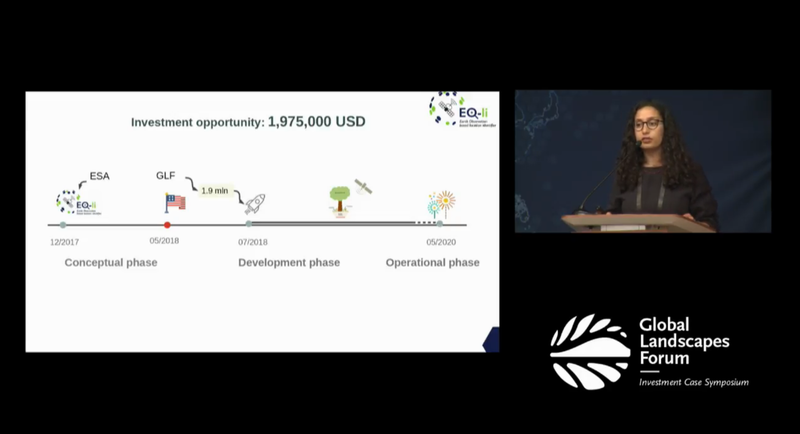 On May 30, approximately 8,000 people tuned into the Global Landscapes Forum (GLF) Investment Case in Washington, DC to connect, learn, share and act around mobilizing capital for landscape restoration and sustainable investment. About 3.6 million people were reached on social media with close to 500,000 likes, comments and shares around the conversation. Actors included local community practitioners, investors and policymakers who came together to share expertise and opportunities for investment. Dr. Hajar Benelcadi from mundialis was on site to present the project EO-li (Earth Observation based location identifier). Hajar is an Earth Observation senior specialist at mundialis GmbH & Co. KG. Her expertise comprises satellite Synthetic Aperture RADAR (SAR) and optical images processing and analysis for forest monitoring, agroforestry and land cover/land use sectors in the climate change context. At the Global Landscape Forum – Investment Case in Washington D.C., USA, there was a so called “Dargons’ Den” event during which selected projects related to land restoration were able to pitch their idea in front of investors and an interested audience. The EO-li project was selected as 1 of 4 projects to present of stage. Hajar presented in the Dragons’ Den event at GLF the EO-li, a global platform with 4 components service platform for land restoration. The vision of EO-li platform is to facilitate the implementation of a restoration multi sectoral project by offering “transparency”, “traceability” and “flexibility” on the whole process from the identification of the project location to learning lessons from it. The EO-li system consists of four service components: (1) identification of the areas to be restored, (2) connection of the different stake-holders through a market place system, (3) monitoring of the progress of the implemented restoration projects, and (4) awareness raising.